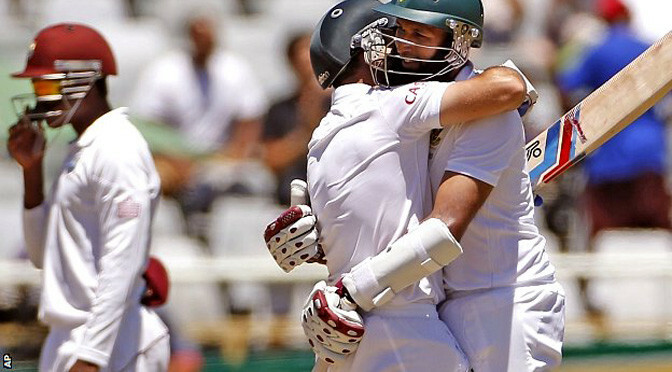 South Africa beat West Indies by eight wickets in Cape Town to win the third and final Test and take the series 2-0. The home side began the final day on 9-1, needing a further 115 runs for victory, and Dean Elgar guided them to their target with 60 not out. Having won the first Test and drawn the second, South Africa took the series to retain the number one Test ranking. The two teams will play three Twenty20 games and five one-day internationals ahead of February’s one-day World Cup. A West Indies collapse on the fourth day, when the tourists crashed from 182-3 to 215 all out, left South Africa requiring just 124 for victory. It was slow going as the Proteas failed to score any runs off the first 44 balls of the day, and Faf du Plessis then fell for 14 just after the hour mark. South Africa captain Hashim Amla made sure there were no more alarms though as he scored 38 not out to accompany Elgar to the end. Meanwhile, Proteas opener Alviro Petersen, who was out for a duck in the second innings after scoring 42 in the first, announced his retirement from international cricket after the game. Having made his international debut back in 2006, the right-hander, 34, appeared in 36 Tests, 21 one-day internationals and two Twenty20 internationals. His highest Test score, 182, came against England at Headingley in 2012. “I feel that at 34 it is time for me to move on with my career,” he said. Petersen has had spells in English county cricket with Somerset, Glamorgan and Essex, and his departure from the international scene opens up the chance for him to return to county cricket as a Kolpak player. Kolpak contracts are signed by foreign players, using a loophole in European Union law to avoid counting against the quota of one overseas player per club.